Apple has officially announced the much awaited iPhone which everybody was looking forward to hear about. Wondering what is Apple iPhone? iPhone combines three products � a revolutionary mobile phone, a widescreen iPod with touch controls, and a breakthrough Internet communications device with desktop-class email, web browsing, maps, and searching � into one small and lightweight handheld device. iPhone also introduces an entirely new user interface based on a large multi-touch display and pioneering new software, letting you control everything with just your fingers. So it ushers in an era of software power and sophistication never before seen in a mobile device, completely redefining what you can do on a mobile phone. The iPhone initially would be available in 4GB and 8GB versions which would set you back by USD $499 and USD $599 respectively. 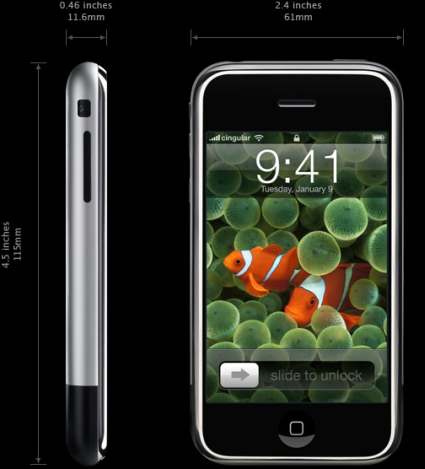 The iPhone is expected to be available in US by June 2007, 4th quarter of 2007 in Europe and first quarter of 2008 in Asia. I am pretty impressed by this product and going to definitely buy it when it is launched in India. The iPhone’s smart sensors have really taken over me. The iPhone features three smart sensors that controls the iPhone’s behavior. iPhone�s accelerometer detects when you rotate the device from portrait to landscape, then automatically changes the contents of the display, so you immediately see the entire width of a web page or a photo in its proper landscape aspect ratio. The proximity sensor detects when you lift iPhone to your ear and immediately turns off the display to save power and prevent inadvertent touches until iPhone is moved away. An ambient light sensor automatically adjusts the display�s brightness to the appropriate level for the current ambient light, thereby enhancing the user experience and saving power at the same time. I would say that the iPhone is currently the best smart phone that money can buy. I feel the other mobile manufacturers like Nokia and Sony Ericsson would come with some thing similar soon. Well iPhone has come into my upgrade list and hopefully it will replace my Nokia 663O smart phone by 2008. All I can advise you right now is to start saving money and get the iPhone at the earliest. us. Please keep us up to date this way. Thanks for sharing.